In the context of Research, Public Engagement Methodologies serve as a tool to align I+D+i projects with the main citizens’ interests and needs. Several strategies have been developed to facilitate the dialogue, reflexion and the involvement of both the broader public and target stakeholders. 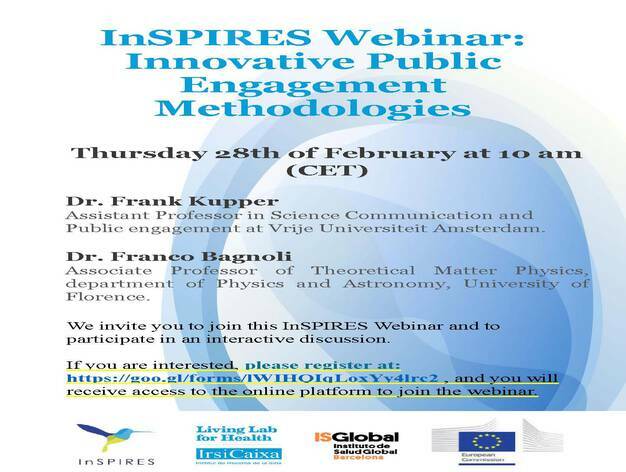 In this webinar, two expert speakers – who belong to two partner organizations of the InSPIRES project – will share their experiences in different public engagement methodologies. Dr Frank Kupper, Assistant Professor in Science Communication and Public Engagement at VU Amsterdam. Blending an STS and Arts & Design perspective, he works on the conceptual and methodological innovation of public engagement processes to shape meaningful conversations at various science-society interfaces. Frank will talk about a dialogue methodology developed in the context of the EU project Nano2all, based on the co-design of scenarios to anticipate future impacts. Dr Franco Bagnoli, Associate Professor of Theoretical Matter Physics at the University of Florence, with wide experience in the field of Science Cafés. His presentation will briefly illustrate the Science Café methodology and how it can be used within the context of Science Shops. He will also share some Science Shops projects, where this methodology has been applied.